Not all hair is created equal. Not all hair is qualified to be on the same weft. We showcase our blending skill on straight, wavy and curly virgin hair. Straight to natural body hair takes a lot less time, skill and hair to blend. When colors are closely matched or compatible, the only real consideration is texture and length. This is a blend of European Russian and our silky Euro line Brazilian hair where only texture and length were considered. We found the slight hair color differences complimentary and blending the bundles together created a natural blended highlight effect. The texture and wave pattern of the finished weft is consistent throughout because of thorough blending and beginning with equal hair pattern and length. Wavy hair creates an additional challenge. Now, not only length being considered, specific patterns and textures need to be identified and separated. A moderate amount of hair in this classification may need to be set aside unused until suitable bundles can be partnered up and blended. The end result, as shown in the weft we blended, is a consistent texture and wave pattern from end to end. Curly hair is the most difficult hair to blend. It can take a significant amount (multiple kilos) to create one weft of hair. Curly hair made into wefts are the most time consuming to create. Once we have hair that matches, the blending and wefting takes no more time than straight or wavy hair. The time consuming part is waiting to receive bundles that will match. After much of this hair is drawn, we may only have 2-3oz of a particular pattern, texture or length. We can only hope the next collection contains 2-3oz more of the same type hair so a complete weft can be made. With Brazilian hair, this is a particular challenge as the supply isn’t as plentiful. In one kilo, for example, there may be two dozen ponytails that are different lengths, curl patterns and textures. A significant portion of curly hair needs to be set aside unused until more hair is obtained and compatible partners are identified. 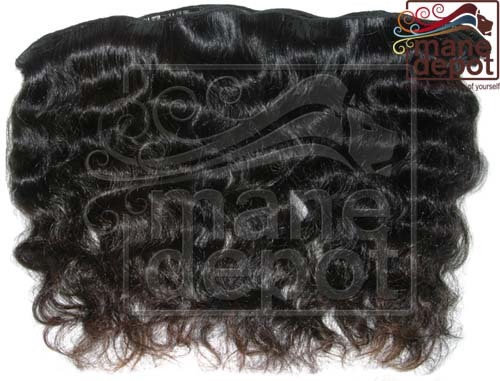 For the weft pictured, it took a significant amount of bulk hair and time to create a weft with this amount of hair. 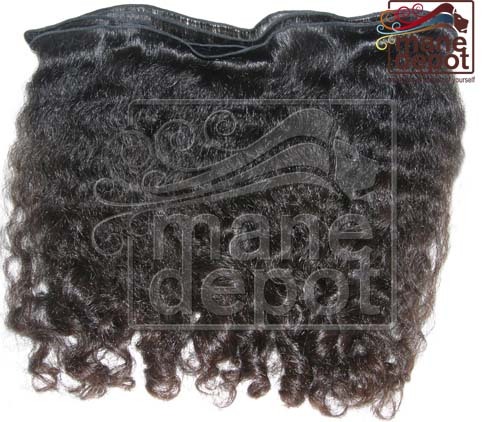 The end result is a complete weft that matches in color, length, texture and curl pattern. Rushing to create curly wefts is not an option if you want consistent, compatible hair from end to end. 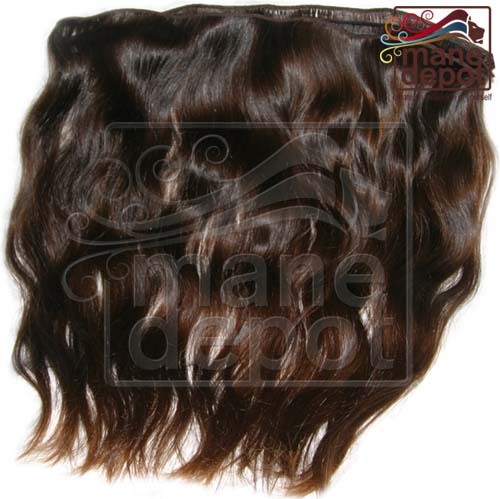 For custom virgin hair products, your source is Mane Depot.